World Rabies Day on 28th of September aims to raise awareness of the impact, prevention and elimination of human and animal rabies, which kills about 55000 people per year all over the world. 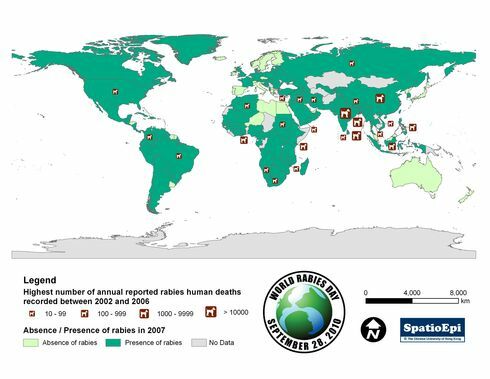 The map shows the occurrence of rabies worldwide in 2007. As depicted by graduated colours, rabies was present in most countries, except for some in Northern Europe, along the Mediterranean coast or islands. The dog symbols indicate the highest number of annual reported rabies human deaths recorded between 2002 and 2006. From the map, the majority of rabies human deaths occurred in Asia and Africa, where post-exposure treatment was costly and inadequate. Data for this map were obtained from World Health Organization. Rabies is an acute infection of the central nervous system caused by the rabies virus. Rabies starts with flu-like symptoms including fatigue, headache and fever, followed by anxiety, confusion, hypersalivation, hydrophobia, inspiratory muscle spasms, paralysis and coma. Incubation period usually lasts for 3 to 8 weeks. Once symptoms of rabies appear, the disease is almost always fatal. The rabies virus is transmitted to susceptible humans after being bitten, scratched or licked by an infected animal. The virus enters human body through contact of the saliva of the rabid animal and the wound. Dogs are the main carrier of rabies and responsible for most of the human rabies deaths worldwide. Other possible carriers include cats, bats, raccoons, foxes, skunks and coyotes. Transmission from person to person has not been documented. Though human rabies is incurable, prompt appropriate medical care, including wound cleansing and receiving anti-rabies immunization after exposure to suspect animals, is effective in preventing death. High risk individuals such as veterinarian and wildlife conservation personnel are advised to receive pre-exposure vaccination. Vaccination of dogs has also been shown to be effective in reducing the number of human rabies cases.